The MXI-4 PXI Bus Expanders allow for direct control of PXI systems from any PCI slot in a desktop computer or server. MXI-4 interface cards can also be used for linking multiple PXI chassis. MXI-4 technology utilizes a high-bandwidth link that is transparent to software applications and drivers, therefore providing the ability to use high performance desktop computers or servers to control PXI systems. 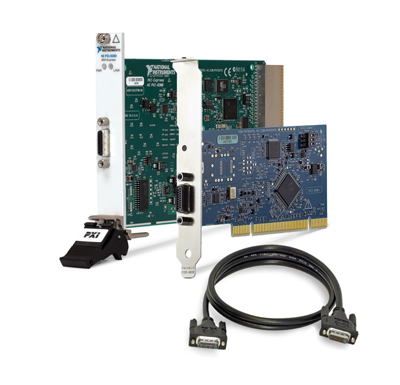 Because PXI is based on the industry-standard PCI bus, MXI-4 Bus Expanders provide a transparent link where all PXI modules appear to the user as if they were PCI boards within the computer itself. However, with PXI technology users benefit from an increased number of slots, power and cooling per slot, module selection, and synchronization features. Additionally, with fiber optic MXI-4 you can electrically isolate your PXI measurement hardware from the PC with extended length cabling up to 200 m.
The MXI-4 Series builds on the standard PCI-to-PCI bridge architecture by splitting the bridge into two halves connected by a 1.5 Gb/s serial link. The PCI specification allows up to 255 buses to be connected in a system via PCI-PCI bridges such as the MXI-4 Series. MXI-4 supports both 3.3 V and 5 V PCI signaling environments, error checking, and re-transmission on the serial link for greater reliability in electrically noisy or harsh environments, and offers industrially rugged connectors. The MXI-4 link consists of a either an MXI-4-PCI-C (copper) or MXI-4-PCI-F (fiber optic) board in the PC, connected via the appropriate cable to an MXI-4-PXI-C (copper) or MXI-4-PXI-F (fiber optic) module in slot 1 of a PXI chassis. For convenience, a complete MXI-4 kit with all necessary components is available, or components can be purchased separately. MXI-4 bus expanders can be used to connect multiple PXI chassis in a star or daisy-chain configuration within a single system, to connect two PXI chassis together, install an MXI-4-PXI card into any peripheral slot of the master chassis, connect with the appropriate cable to a second MXI-4-PXI in slot 1 of the slave chassis.